Appetite Upside Down! Plus Recipes. Well, I just can’t believe what’s happened to my appetite. ‘Appetite Upside Down’ is the best way I can describe it! Before I started Chemotherapy my Doctor warned me that it may affect my appetite, and she was right. My ‘sweet tooth’ has disappeared, I’ve gone off both red and white wine, even my favourite Prosecco! But sister Mel suggested I try Cava, not so sweet, and she was right. The creamy sauces that I have always loved are off my menu now, and sweet snacks are a definite ‘no’. Cashew nuts and almonds have taken over (probably very good for me at the moment), and I just long for Mediterrean-type salads and Antipasti dishes. Poor Erik has taken over a lot of the cooking, just for now, and feels seriously under pressure to cater for my weird appetite. Added to which I feel quite hungry at the moment, but when faced with a meal, I fill up very quickly! So, what’s the answer? Desperate to find food both healthy and appetising, I’ve been searching out recipes that I hope I will enjoy. Visually appealing, full of good food but not too heavy is what I have been looking for, and I think I have come up with a few. See what you think. 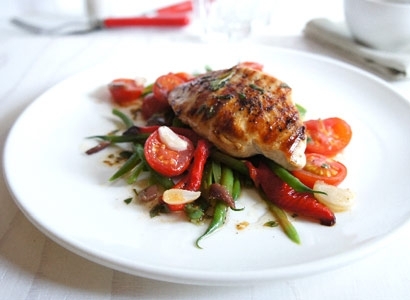 This Warm Chicken Salad is a recipe from Angela Nielsen. It is similar in taste to such as Salad Nicoise, with the beans and anchovies. I will maybe brush the chicken with a spice such as Ras al Hanout before cooking, just to give it extra flavour. You could also add black pitted olives just before serving to the plate. I'm really looking forward to this one. Hope you enjoy it. Lightly oil a baking sheet and lay the peppers on it, cut side down. Rub a little of the oil over the pepper skins. Roast the for 35-40 minutes or until the skin is blackened or charred. Tip the peppers into a bowl with any juices and immediately cover with plastic film. This will create steam and make the peppers easier to peel. Set aside to cool. Meanwhile lay the tomatoes on the baking sheet, scatter over the garlic slices and drizzle over 1 tbsp of the oil and toss together to coat. Season with salt & pepper. Roast for 6-8 minutes until the tomatoes are starting to soften and burst but still holding their shape. Cook the green beans in boiling water for 6-8 minutes until cooked but still crunchy and green, then drain. When the peppers have cooled enough to handle, peel off the skin and rip or slice the flesh into strips, removing the stems, cores and seeds as you go. Reserve the juices in the bowl, and mix with the lemon juice, the remaining 3 tbsp of oil, the oregano and any juices from the roasted tomatoes. Season with salt and pepper. Lay the beans on each serving plate the casually scatter over the pepper strips, tomatoes and garlic and anchovies. Heat a griddle pan. Brush the chicken all over with a little extra oil and season with salt and plenty of pepper. Place the chicken on the hot griddle pan, skinned side down, and cook for 10 minutes, turning half way through. Serve on top of the salad. I wanted to publish more recipes in this blog post, but unfortunately the ZipList recipe has been altered and won’t let me add more than one recipe per post, so the other recipes will follow on from this. Bit of a nuisance, but hey, technology doesn’t always make things easier, does it. Just to let you know, by the way, the chemo is having the right effect on my problems, and I’m doing incredibly well, according to my doctor. Just need to sort out my appetite now! Anyone Fancy a Wood-Fired Oven?